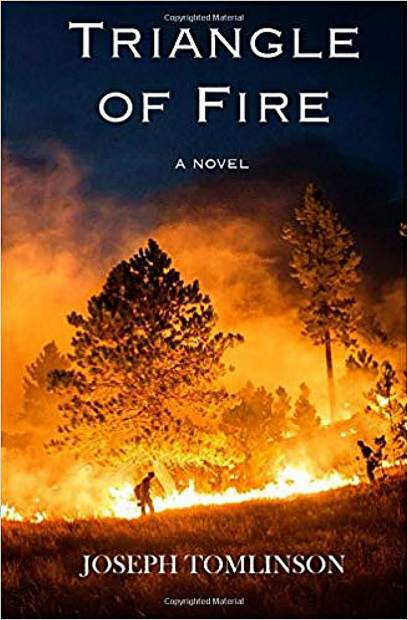 “Triangle of Fire” follows the life of a wildland firefighter for a season on a Forest Service hotshot crew based in backcountry Santa Barbara. It is available at selected bookstores throughout California. I’m past nostalgia when the smoke hangs heavy and the news crackles. These days, like the neighbors, we’re holding our breath, wary of the heat, the gasoline grass, the oak stands, the one road out. We moved about two rock throws from an edge of last fall’s Lobo Fire. On edge. That’s us. Fires everywhere, up north, west, down by Yosemite. Burning more than ever, one report a bit wildly asserts. I loved the big seasons once, when I made my living fighting these blazes. It took a good decade before I stopped flinching in my sleep as if swinging a super Pulaski, before I stopped feeling I missed the call, was missing out, this career that might have been. That’s all long passed, a whole different life before the kids, since grown. Now we make plans for grabbing the animals, which valuables to scoop up, and what to put in the go box by the door. Then I read this damned book, “Triangle of Fire,” a novel about my very crew, the author’s story tracking remarkably close to my own real life. The fire line, the long drives, the store after work. The novel’s hero even stuffs a paperback in his gear like I did. Everything but the motorcycle he drives instead of the pickup nearly everyone else has. I had a pickup then, yellow and small. Hadn’t given it a thought in decades. Joe Tomlinson tells me his story’s fiction, not a memoir. Lots of stuff happens in the novel that didn’t in reality. He didn’t really brawl at Cold Springs Tavern. The love interest, a beauty from Ventura, is fictional. Most of the characters are entirely made up. But I recognize the Supe, my foreman Bonehead, Killer, Lumpy. They leap off the page, along with the banter, the KFC on smaller fires, looking for a pay phone to call that girlfriend who wondered where you were for weeks, you wondering if she’d still be there when you got back. Sometimes not. His hero lives in Isla Vista, the funky beach town next to UC Santa Barbara. I lived there. The crew in the story flies to Montana. We flew there and as in the story got some free time to hit town, not necessarily a good idea. The hero spends a night in the Santa Barbara County Jail. I met a former crewmate in the tank, the one memorable night I passed there. This is getting uncomfortable. I’m remembering everything now. The awesome highs, and what I’m still embarrassed was me. The story is about a guy on a hotshot crew — reporters usually tack on “elite” for the special forces role of this team, which is true if oversold. They do go to the toughest parts of the toughest fires. For grit, they do give the Seals a run, and in my time this was the more dangerous work. It’s just as true that for the pay, this is about the dumbest thing you could choose. We got mistaken for cons more than once. There’s a coming of age element to the story, though not in an adolescent way. My own greater passage came in my 20s, and the hotshot experience shaped me far more than any school. Maybe best, though, to move along in time, as Tomlinson did. He went into wine distribution and sales, and like so many of my crewmates, became a leader in his new field. Today he lives and writes in Napa. He hustled out “Triangle of Fire” last fall after our mutual foreman, Stan Stewart, died of cancer. He wanted to donate proceeds to Stewart’s family. So he sidestepped trying to land an agent, then a publisher, the whole slog, facing long odds and way too much time. Self-publishing has become viable, especially if you’re willing to handle your own marketing. The story simmered for nearly two decades after he wrote eight pages in his 20s. Finally, between jobs, he had time, a year to focus on the writing. I can vouch for authenticity, having lived this story. It’s not sugar coated or falsely heroic. What might seem bigger than life I saw happen, and the love story feels right, too, with similar sweetness and familiar conflicts. I read and suddenly remember my beeper going off at 2 a.m., me hustling into my clothes and boots, she asking, “Where?” “Don’t know.” “How long?” “No way to tell.” “Well, you certainly seem awfully happy about it.” She’s not. The book brought it all back, all those memories, these guys, real life heroes and mentors. But hey, shake it off. The lawn needs mowing, boxes moved. We’re still getting settled. And so I steal home early and get focused. She set out a tub for the garage. At the top was a pair of White’s, rough side out still fuzzy, waffle grid intact, bought for the last season I never had. Yeah, I earned a funny look. Like what, I was going to lace ’em up again, one more time? Well, I kind of felt like it.